The Aztec Empire was one of the most important pre-Columbian empires in the American continent. The Empire was formerly founded in 1428 but the city-state existed much before that with its own capital. The capital of this Aztec city-state was called Tenochtitlan and it was established in 1325. At the peak of the Aztec Empire, it was the largest city in the Americas. The city was eventually conquered by the Spanish Conquistador, Hernan Cortes, who completely destroyed it and later on established it on new foundations. Other than being the political centre of the Aztec Empire, Tenochtitlan was also its cultural centre. The city was founded by the Mexica people on an island in Lake Texcoco located in the Valley of Mexico. It was founded on June 20, 1325 and remained the capital of the Aztec city-state and then empire until its conquest by the Spaniards. The Mexica people established this city based on a religious prophecy according to which the wandering Mexica tribes would find the location of the city on a place signalled by an eagle eating a snake perched on a cactus. They saw this vision on a swampy land and went on to establish their capital city there. The origins of the name Tenochtitlan are thought to have been derived from two Nahuatl words “tetl” meaning rock and “nochtli” meaning prickly pear. However, a manuscript found in the 16th century suggests a different etymology so that the exact etymology of the name remains uncertain. This is particularly true because of the lack of written language before the Spanish conquest of the Aztec Empire. The city was established on a very unusual terrain where the ground was swampy and therefore the land had to be expanded artificially. It covered an estimated area of 8 to 13.5 square kilometres and was situated on one side of Lake Texcoco. At the time of the Spanish conquest, the city expanded from Tlatelolco in the north to the swamps in the south. Various causeways leading north, south, and west of the city connected it with the mainland. There were several bridges on the causeways which could be pulled away in order to defend the city. 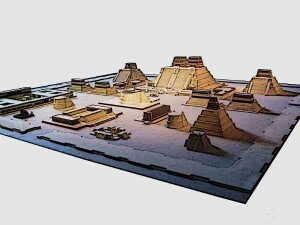 Proper planning was done for the construction of the Aztec capital, Tenochtitlan. The city was divided into four zones called “campan” with each zone further sub-divided into 20 districts known as “calpullis”. Each Calpullis was then crossed by various streets called “tlaxilcalli”. Three main streets crossed the city with each leading to one of the three causeways to the mainland of Tepeyac, Ixtapalpa, and Tlacopan. According to the reports of Spanish Conquistadors, the streets were wide enough for ten horses. The causeways were surrounded by artificial floating gardens. 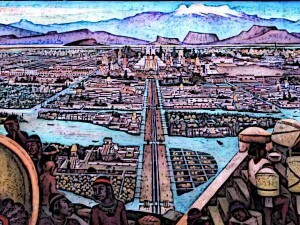 Thus proper planning was reflected throughout the Aztec capital, Tenochtitlan. The marketplaces of the Aztec capital Tenochtitlan were the most important places of socialisation and commerce for the Aztec people. Each district had its own marketplace in addition to the main marketplace in the sister city of Tenochtitlan called Tlatelolco. It was a vast marketplace which, according to the famous Spanish Conquistador Hernan Cortes, about twice the size of the Spanish city of Seville with about 60,000 people trading daily. Additionally, there were also marketplaces in other cities of the Aztec empire. The most important public buildings in the Aztec capital Tenochtitlan were the temples and prostis. Another important public building was the ceremonial centre which was located inside a walled square. The public building of central importance was the famous Templo Mayor which had two temples, one dedicated to the Aztec patron deity of Huitzilopochlti and the other to the rain god called Tlaloc. Other important public buildings in Tenochtitlan included the Eagle’s House associated with warriors and ancient rulers, the Sun Temple dedicated to Tonatiuh, the temple of Quetzalcoatl, various platforms for gladiatorial sacrifice, and some other temples of minor importance. This is a model of the Aztec Capital of Tenochtitlan – The most important public buildings in the Aztec capital Tenochtitlan were the temples and prostis. Moctezuma II was one of the most important Aztec emperors who reigned from 1502 to 1520. It was during his reign that first contact was made between the Aztec civilisation and the Spaniards. The emperor had various palaces at his disposal with the central palace having two zoos – one reserved for birds of prey and another one for other kinds of animals and birds. The palace also had a botanical garden in addition to an aquarium which consisted of various fish and aquatic birds. The emperor also had palaces in Texcoco, Chapultepec, Huaxtepec and Texcotzingo. The arrival of the Spanish conquistadors proved disastrous for the Aztec people. When the Spanish Conquistador Hernan Cortes arrived with his men in the Aztec capital Tenochtitlan, he was thought to be the God Quetzalcoatl who had finally returned as promised in an ancient prophecy. Thus he was welcomed in the city with the ruler and the lords lining up for him, although he was not allowed to touch the ruler. Cortes then presented a necklace of crystals to the emperor. However, soon differences arose between the different groups with some of Cortes’ men being killed. This resulted in Cortes capturing the emperor and which led to a deterioration of the situation which led to confrontations. The ensuing hostilities between the Aztec people living in the capital Tenochtitlan and Cortes’ men resulted in the destruction of the city. It all started with the siege of the city by Cortes which extended to seventy-five days and reduced the inhabitants of the city to utter famine. After capturing the city, Cortes ordered its systematic destruction and levelling. After that, the city was rebuilt according to a new plan with the central area reserved for the Spaniards along with an outer Indian section. The Ruins of the Aztec city, including the ruins of the famous Templo Mayor, have been excavated and findings preserved in the popular museums visited by tourists. The Aztec capital Tenochtitlan was the most magnificent city of the Aztec empire and its political and cultural capital. It was established in 1325 and continued to grow in its size and importance. The city was properly planned with several zones and districts and also had various marketplaces. Since it was located on an island, it was connected to the mainland through various bridges. The city was eventually conquered and destroyed by the Spanish Conquistador Hernan Cortes.